cv. of amoena x Gem by Joan White 1967. Notes on this plant from Derek Butcher. "Patience is a virtue. It must have been in the 1980’s that we acquired this plant from Art Gummow. He had lost the label and yet it was a Billbergia worth growing. It seemed to hold its red leaves with white spotting forever and because it did not flower the older plants did not deteriorate as more offsets were produced. In fact an ideal plant if you only looked for its leaf colour. Art had never flowered it either so it was a surprise in 2005 when it did flower with pale pink scape bracts and predominantly green inflorescence. Perhaps the trigger was our extra wet October/November. 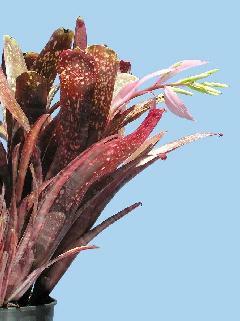 The inflorescence is reminiscent of Billbergia ‘Grace Goode’ and those with reverse parentage but not quite. Regrettably many of these ‘old’ hybrids have not been photographed so we do not know their finer points to allow us to directly link our plant to any of these named cultivars. The plant also looked like some of the photographs Peter Franklin of Raymond Terrace, NSW had sent us over the years. Thank heaven for internet and Email because I was able to refer our photograph to him. Peter has a unique way of identifying his plants. The name is of secondary importance because each clone is allotted a PAF number and where he got the plant. The use of these numbers and corresponding photographs Peter was able to go to his live plants to seek confirmation. Yes, our plant fitted very well indeed with Billbergia ‘Pria’ – a plant that Peter had got many years ago from Bill Morris. ‘Pria’ came into being in 1967 well before Grace Goode got into the act. The hybridiser was a Joan White who used B. amoena and a plant then known as B. glymiana. Yes, even in those days there were naming problems. Here a species name – albeit an old one linked to B. morelii – had been used for what was eventually agreed to be a hybrid of probably chlorosticta (now saundersii) x amoena and I coined the name ‘Gem’ in 1990. Also in 1967 Joan White made Billbergia ‘Red Raven’ and its identity and coloured photo is firmly in the records. Thanks to Peter we can now add a photograph of ‘Pria’ to the official records to make identification easier!"